If you’re used to running with the wrong crowd and often deal with mass quantities of possibly fake, large denomination paper currency, you are probably the kind of person inventors had in mind when developing the UV Key Ring Counterfeit Detector. For those on the go who need to be in the know, the UV Key Ring offers an easy to carry device for calling counterfeiters on the carpet. 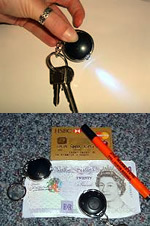 The miniature key ring has a lithium battery powered ultraviolet light. It’s ideal for joining your keys, detecting UV marks and identifying counterfeit currency and credit cards. The UV Key Ring retails for approximately $10, but remember, lithium batteries are not cheap. 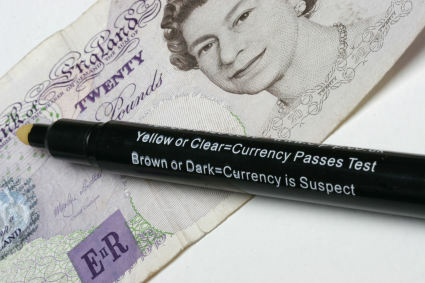 However, if you find that you are living so many questionable currency exchange situations that you’re running through batteries at the speed of UV light, this little invention might just pay for itself in fake twenties and fifties. And if you find that you just can’t bare to part with your souvenir Lake Tahoe key ring, worry not, you have yet another option that may fit your on the go counterfeit currency detecting needs. The Portable Conterfeit Detection Pen is a compact ultra violet light unit that, just like the UV Key Ring, identifies UV marks on credit cards and paper money. In a conveniet pen form, it offers quick and easy identification of illegal forms of payment. Photon has been advertising counterfeit detection uses for their UV flashlights for years now. They are also more powerful and less battery-hungry, although they are more expensive. Warning: Do not point UV Photon lights at eyes.